In the days before a certain blue hedgehog came along to claim his throne as the defacto mascot, I imagine that the process of selection for properties to help consumers identify the brand as a fairly chaotic affair. The way I visualize it, there's a huge bulletin board on a wall, covered with images of new IP, and the executives are throwing darts to determine what gets the greenlight. And, thus, we get Greendog: The Beached Surfer Dude, a lanky, mop-topped figure with no face and baggy shorts. His platform game never attained much popularity, but its unique visual style drew me in. I recall it being a fairly entertaining title, although frustrating in parts with some cheap death opportunities. Follow along after the jump as I play Greendog. The story of Greendog: The Beached Surfer Dude is thus: After riding a "killer" wave, one which was no doubt "radical" and/or "tubular," our protagonist finds himself face first in the sand. Upon extricating himself from the beach, he discovers that a necklace holding a gold amulet is around his neck which he cannot remove. The amulet is of Aztec origin and bears a terrible curse, according to his oddly-educated girlfriend, Bambi. While Greendog wears it, all living creatures will go mad in his presence. Worse yet, he is unable to surf. To break the curse, Greendog will have to find the six parts of a lost Aztec treasure, hidden in ruins around the Caribbean Islands. Thus, armed only with a frisbee, the grounded surfer begins his quest. 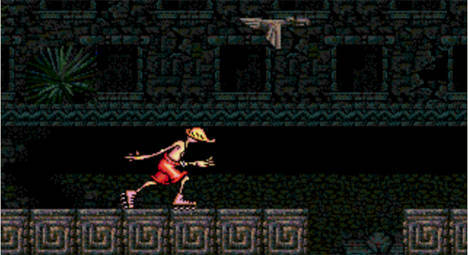 The gameplay is pretty standard platforming fare, with a wide assortment of enemies and environmental hazards. What makes it interesting is that the whole experience, from the level design to the soothing, steel drum music, evokes a relaxed sort of play. Greendog is somewhat like the anti-Sonic in this respect, as he slowly plods his way through the levels. Which isn't to say that it's boring, merely serene in comparison. Enemies do plague constantly and they're an entertaining lot. Pirhanas leap out of water and attach themselves to Greendog while birds dive bomb. Many of the creatures have reactionary attacks which activate upon being hit by Greendog's frisbee. One of the best choices, and one that exemplifies the low-key nature of the game comes with the water hazards. Up until the last few areas of the game, they're completely non-fatal despite being everywhere. The only punishment for landing in them is another pirhana on your leg. It's a nice change of pace from some of the more brutal platformers of the era. Levels also have a pleasant variety. In any given island, there may be a section of basic, horizontal travel, a maze-like dungeon and even an area where you skateboard or rollerblade past obstacles and enemies. This latter one is where the game ramps up (puns are awesome) its challenge level, as Greendog's momentum on wheels can make him difficult to control. Add in a few annoying birds and you have a formula for frustration. Further adding to this variety are the travel stages between levels. These act as a sort of bonus round, where point value items rain from the sky while Greendog pedals a little gyro-copter. In the game's final areas, these become a torrent of both items and creatures and even become life-threatening if you fail to exercise caution. 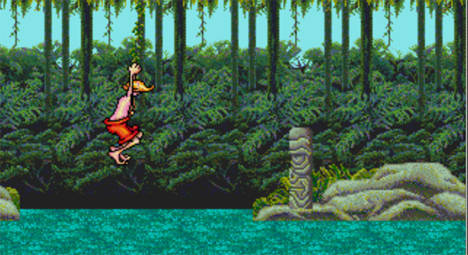 And what platformer, particularly one centered around a surfer and set in the Caribbean, would be without a water level? Greendog has one, and it's one of the finer examples I've ever seen. 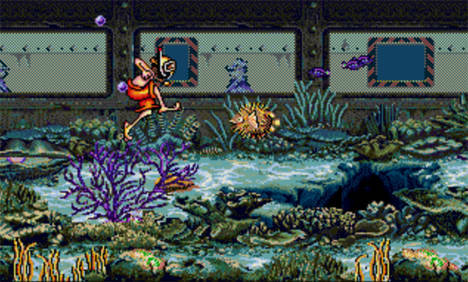 Air is needed and always in ready supply, but the sense of urgency is more subtle than in most games which require submerged characters to breathe. The steady "plop" of air bubbles escaping Greendog's snorkel simply becomes slower in pace to indicate his need. It's a welcome change of pace from alarming music or gagging sound effects. The water level also features one of my favorite aspects of the game as a major component. Many sections of levels will feature obstacles which drag Greendog backwards, forcing him to regain ground should you fall into the trap. Because the game isn't all that difficult, on the whole, this sort of punishment works really well to encourage players not to get too relaxed while playing. Throughout the levels are assorted containers featuring score accumulating items and the occasional health item or power-up. These really only appear in the first few levels of the game with any frequency, becoming rare and highly prized later on. It's an effective means of grading the difficulty and late levels can become tense indeed. But, for all the positives as a platformer, it's the game's visual aspects that really steal the show here. I positively adore the knobby look of Greendog, even if it's hard to tell if that's a straw hat or hair on top of his head. Great attention was obviously paid to the art design and animations are very fluid throughout. Environments and enemies all have lots of little details and it can be fun simply to look at what was accomplished so early on in the life of the console. The conclusion of Greendog: The Beached Surfer Dude implies that the game was to be the first in a long line of Greendog titles. Sadly, this was not to be. 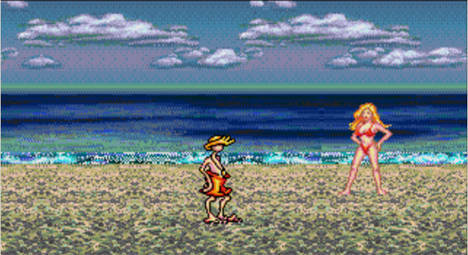 After a Game Gear port of this title, no further adventures were to be had for the beach bum. It would have been surprising, to say the least, for Greendog to have wound up being the face of the Genesis/Mega Drive era for Sega. He has none of his own, after all, and his game is just a little too strange for common acceptance. It's a great game, however, and one that deserves much more attention than it received.